Made by the Rootes Group, the Humber was essentially a combination of the Karrier KT 4 artillery tractor chassis and the armoured body of the Guy Armoured Car. The KT4 was already in production for the Indian Army, and Guy were having problems with the production levels required. The Karrier name was dropped to avoid confusion. The Mark III improved upon the Mark II by providing a three-man turret. Mark III production ended in 1942 after 1,650 had been built. 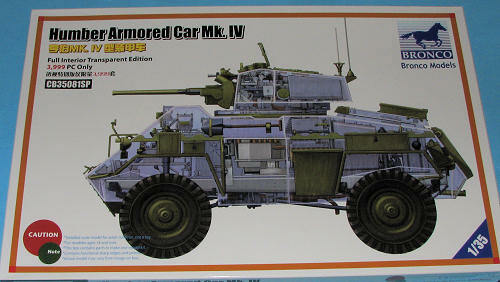 With a possible replacement, the 2-pounder armed Coventry armoured car, on its way, the Mark IV was designed. This put the US 37 mm gun in the turret but at the cost of one crewman. The Coventry was not ordered as a replacement and so production of Mark IV continued, for a total of 2,000, despite its flaws. This one continues Bronco's impressive line-up of military vehicles with oodles of detail and for this boxing, the ability to use a full hull and turret that are molded in clear plastic. T his allows the intensively detailed interior to be much easier to see from the outside. While I know that this sort of thing isn't in demand by all modelers, some will build it such that either all the interior detail can be seen or by only partially painting the outside so that there are easy to see openings via the clear bits. The two clear sprues are duplicated in standard styrene for those who might prefer a standard build. 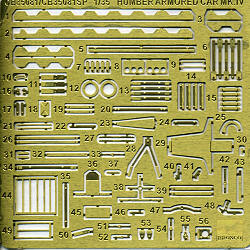 The interior detailing for this kit is the best I've seen in any military vehicle kit. A full engine, full suspension, radio fit, ammo storage, complete gun detail, driver's position, transmission detail, gunner's position and commander's position are among the areas of detail one normally doesn' t find in armor kits. Bronco has included a photo etch fret to handle some of the finer detail parts and they seem to be quite appropriate for the medium, representing mostly flat pieces. 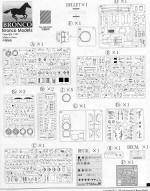 Bronco's 38 page, full color construction book is a real boon to the builder and one of the finest I've seen with any kit. Most of the superb construction drawings are in black and white, but many of the detail bits and some of the more complex constructs are in full color. Spread over 50 construction steps, it makes what could be a very busy build into something that will be easier for most to handle. 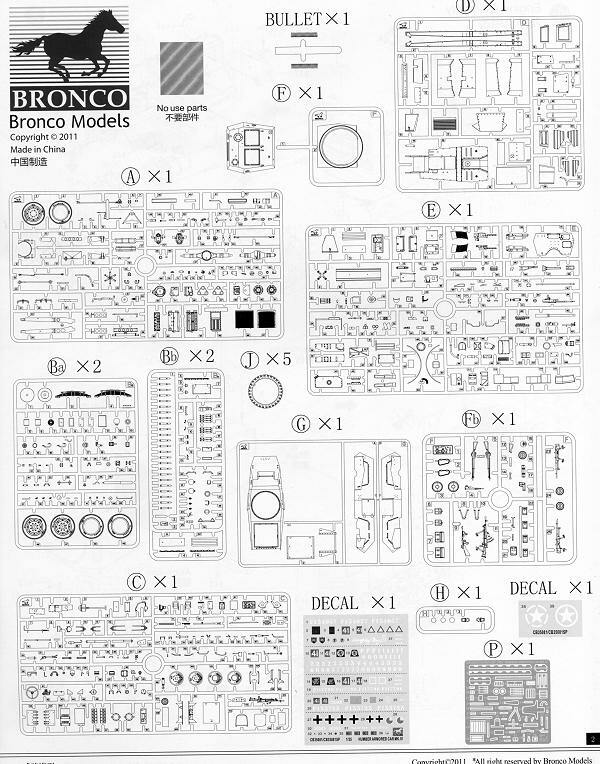 Bronco offers color information with a variety of manufacturers and five markings options, all in overall olive green. There is a captured version without the gun from Italy in 1944, two from France in 1944, one as used in Belgium during later 1944 and one that went into Germany during 1945. 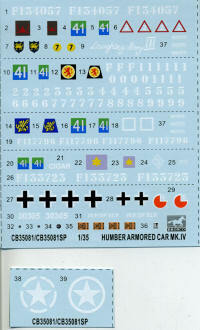 The decal sheet is very nicely done and includes all the unit badges for each option. I have to say that this will be a very impressive model when you are done, regardless of whether you use the clear bits or not. But it would be a shame to hide all that great detail.